As most of you know, I will be moving to a new school in the Fall, teaching 6th grade in a program for the highly gifted. This is quite a shift from teaching 4th grade at a Title I school, but I am excited about the challenge and adventure this new job presents. In two weeks, I will go to the first of 3 workshops I need to attend before school begins. Although this will be my first official foray back into middle school I have been thinking about it. As with any grade change, it is important to know what to expect in terms of curriculum, but also in terms of what kids should be able to do. A friend of mine has a daughter who was in 6th grade last year at Jackson Middle School.. She told me throughout the year about the longterm Biomes project her daughter was doing in class. It was complex and multifaceted, culminating in fiction and non-fiction writing. Her teacher was so impressed with the student’s results, he got in touch with a local publisher and had his students’ work published. Alive and Well. Mostly. is a collection of the fiction that these 6th graders wrote. From the Publisher: Alive and Well. Mostly. 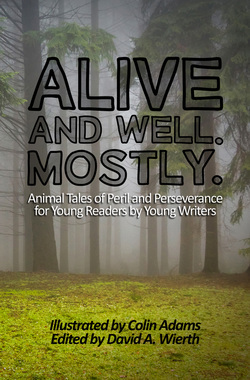 Animal Tales of Peril and Perseverance for Young Readers by Young Writers, illustrated by Colin Adams and edited by David A. Wierth is a collection of imaginative short stories about animals in their native biomes. Migrate through the ocean with an adventurous narwhal, defeat a badger army with the king of the owls, befriend a firefly with a vengeful howler monkey, or navigate complex social dynamics with an arctic wolf. Each story is sure to draw you in: friendship, family, predators, betrayal–this book has it all. As I read the first story, I laughed, because I could picture the writer. And this feeling continued throughout the book. These are excellent stories, written by 11 and 12 year olds. Their stories reflect their age, but they also reflect a lot of research and editing. The result is an excellent volume that I will add to my classroom library once I get around to setting it up. You can find out a little more about it on the publisher’s website. If you have a young person who loves to write, they might enjoy reading this delightful collection, and it might inspire them to write their own stories.